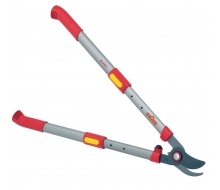 The telescopic operation with high-strength individually-adjustable aluminium gripping handle tubes, guarantees the extended reach of the RS 650 T telescopic lopping shears. 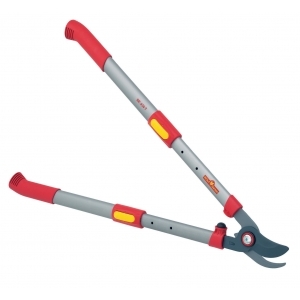 This allows both easy access to cut the higher branches on a tree, and also permits convenient cutting up of branches on the ground without strenuous stooping. Moreover, the light weight makes work easier. The two blades give these telescopic lopping shears a very precise and clean cut on branches up to approx. 40 mm diameter. WOLF-Garten RR 650 T telescopic lopping shears have an overall length of approx. 650-930 mm.